gumsZahnfleischIt seems as if people are talking more and more about simplifying their lives these days. There are plenty of articles — and even a popular magazine called Real Simple — which tell you just how to do that. And there have certainly been a lot of innovations that make life easier, many of which are technology-based. Just think of all the smart applianceintelligentes (Haushalts-)Gerätsmart appliances that are now coming onto the market. There’s one area, though, where things are not becoming simpler. I’m talking about the increasing number of choices we face these days when shopping. Take ice cream, for example. When I was growing up, we were usually offered a choice of chocolate, vanilla, or strawberry. Today, the list of ice-cream flavors is endless. New ones are constantly being introduced, as unpopular ones — such as bubble gum or garlic — go out of fashion. Should your clothes be clean or stainless? After eating all that ice cream, you’ll need some toothpaste. In the past, you just chose your favorite brand and size. Now, each brand offers not only a huge number of flavors, but also different benefitVorteil, NutzenbebenefitVorteil, Nutzennefits. You can decide whether you want your toothpaste to whiten your teeth, strengthen them, make your gums healthier, freshen your breath, or eliminate plaqueZahnbelagplaque. Some toothpaste is just for kids — in which case, bubble-gum flavor is still popular — while other types are for people with sensitiveempfindlichsensitive teeth. You’ll also have to spend a lot of time in the laundry detergentWaschmittellaundry detergent aisleGangaisle of the supermarket, deciding which one is right for you. Do you want a detergent that gets your clothes clean, or do you prefer one that gets the stainFleckstains out? Is there a difference? And how should your laundry smell when it comes out of the washerWaschmaschinewasher? Like lavender, perhaps? How about “mountain spring”? Or you could just go with the “clean bursthier: Duftexplosionburst” aroma. As far as I know, they’re not making detergent that smells like bubble gum — at least not yet. And don’t even get me started on choices in lightbulbGlühbirnelightbulbs: halogen, LED, CFL (compact fluorescent lamp)KompaktleuchtstofflampeCFL, fluorescentLeuchtstofflampefluorescent, floodlight, spotlight, bright white, or soft light. The list goes on. Even choosing the right peanut butter is a challenge. Do I want all-natural or regular, chunky (ifml. )mit groben Stückenchunky, crunchymit Stückchencrunchy, or smooth, honey-roasted or sugar-free, low-carb (ifml. )kohlenhydratarmlow-carb or low-sodiumnatriumarmlow-sodium? I don’t think they’ve developed a peanut butter for people with peanut allergies yet, but it’s probably to be in the works (ifml. )in Arbeit, in der Mache seinin the works. I recently read that having too many choices can be a bad thing. For example, does Amazon really need to offer 1,161 different toilet brushes? If we spend so much time worrying over our options, we might avoid making a decision for fear that we’ll make the wrong one. In some cases, this could be a good thing. If I can’t decide on a flavor of ice cream, I’ll avoid all those extra calories. On the other hand, the inability to choose the right lightbulb, laundry detergent, or toothpaste could be more problematic. 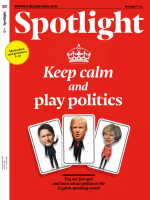 Dieser Beitrag stammt aus dem Spotlight-Magazin 4/2017. Die gesamte Ausgabe können Sie in unserem Shop kaufen. Natürlich gibt es das Magazin auch bequem und günstig im Abo.